Placed below Malaysia, Singapore is a wonderful family friendly destination mainly due to its compact size, world class public transport system, lush-green atmosphere, a sublime food scene, and bursting with cultural diversity. With its abundance of several attractions for all age groups, you can rest assured for a fun-filled day out in this beautiful island. Now visiting Singapore with your family is no longer a dream, connect with your local tour operator and ask for the best Singapore family holiday packages which would feature the best of Singapore’s offerings. We have listed some of the places which you can visit with your family when you are on a holiday in Singapore. Hop on this traditional boat along the Singapore River is a wonderful way to explore this city. The Bumboats play a key role in preserving the river heritage of its old charm and memory since its re-introduction in the year 1987. SRC was one of the first operators to provide river cruises and has received a popular response from tourists and visitors from all around the world. You can either select a day ride or a night ride depending on what your requirements are. A day ride gives you the warmth of the sun and you can feel the fresh breeze flowing as you board the bumboat. There are ongoing live commentaries to keep the ride enhancing and entertaining. A night ride gives you a chance to skip the sunny heat and gives you access to a starlit sky and city line. There is no particular reason but the night ride looks more mesmerizing, romantic, and relaxing as compared to a classical experience in the day. 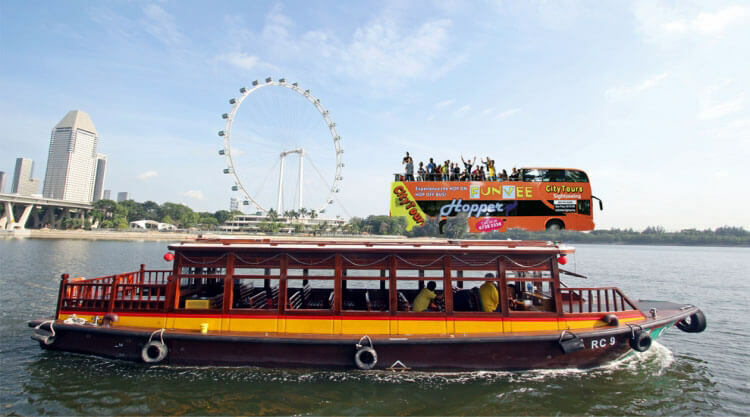 You can be assured to undertake a journey of a lifetime no matter which time of the day you onboard the bumboat. You can also look for cheap Singapore tour packages if you are on a fixed budget. This interactive museum on Upper Jurong Road is a big hit among the young kids and is a perfect way to explore the past and present with focus on the rich cultural heritage of Singapore in fun way. There is a dedicated art gallery, outdoor play area, and a science museum which is surely going to keep you and your little ones engaged. You can opt for the various tour packages which start from 10 SGD for adults and 6SGD for the younger ones. The tour package features admission to the center, a bus tour to the mighty Singapore Military Institute, and a short 3D movie. 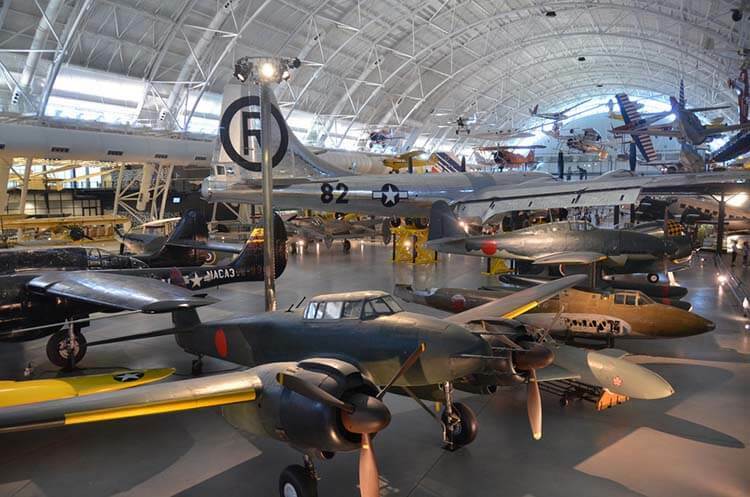 The Army Museum shares the same neighborhood, so you can club both attractions to be covered in a single day. There are guided tours arranged every hour from 10:30 am to 4:30 pm. The cultural journey includes a Singlish test (A mix of Singapore and English). The environment is vibrant and offers a relaxing environment. You can also check out the food court and a small selection of fast food restaurants where you can grab a quick bite during your journey. 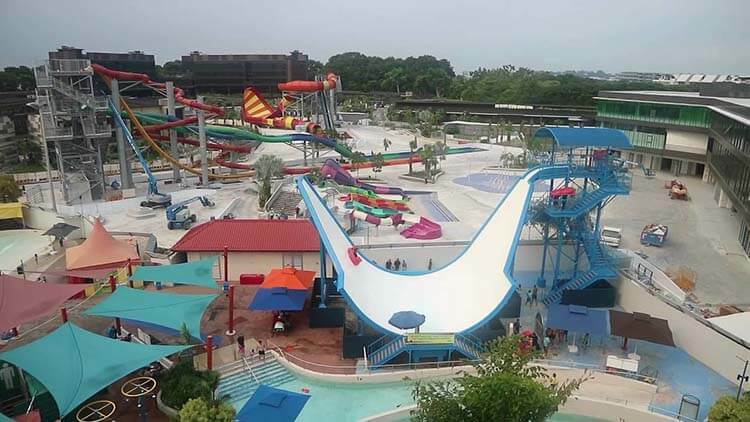 One of the popular waterparks in Singapore near Changi for an action-packed day in the water. This place gives you the perfect balance for some fun in the water, adrenaline-pumping slides, along with gentle flumes and pools for a relaxing and refreshing experience. Placed at Downtown east, there are different ticket and package options to choose from. Advance booking is not required as you can get tickets easily on the door. This is a common feature in many Singapore family holiday packages. Some of the popular slides include Ular-Lah, which is the first white water raft slide in the entire of Southeast Asia, Shiok River, Side-Up, the Water Works, Torpedo, apart from the relaxing and laidback attractions like the Professors Playground which has a mix of padding pools, water cannons, fountains, and small slides. Explore the Yippie area for a similar indulgence. Do head to the Jacuzzi towards the end of your tour to relax those tired legs and shoulders. You also have a small selection of cafes and restaurants where you can enjoy a meal or grab a quick bite for lunch. Opened at Sentosa Beach Resort in the year 2015 which is the probably the latest additions to the family friendly activities already present on the Island. There are fun interactive learning stations dotted around the kid-sized city. There are role-play activities where your kid can choose the role and work on their skills in a fun way. The mini introduction to the global economics concept is one of the cool features here where your kids gets a chance to earn a salary in KidZos, the official currency where they can pay for their products and services and even operate a bank account. The activities here are focused on boosting the child’s confidence, communication and teambuilding skills and promoting creative and logical thinking. 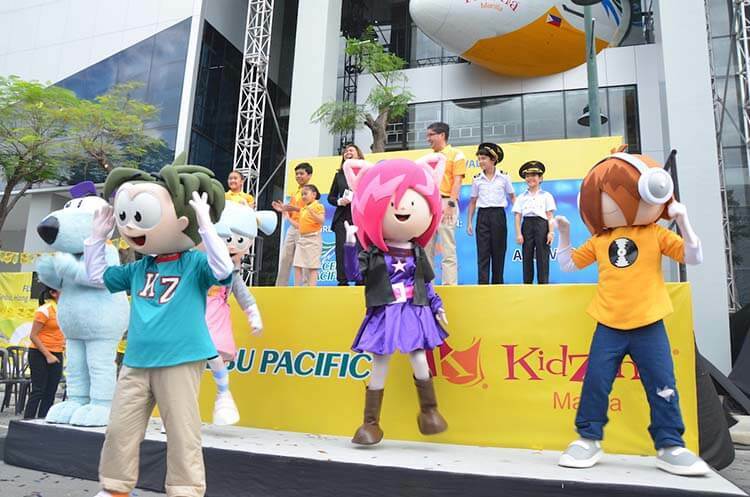 There are six basic rights defined here in KidZania. They are ‘to Be’, ‘to Know’, ‘to Care’, ‘to Play’, to ‘Create’ and ‘to Share’. A second visit helps your kid revisit and know the character better portrayed by them last time. This is the largest observation wheel in the world which is built on a three-story terminal building. Standing tall at 165 meters high and 150 meters in diameter, this wheel travels at 0.21 meters per second and offers once in a lifetime experience. 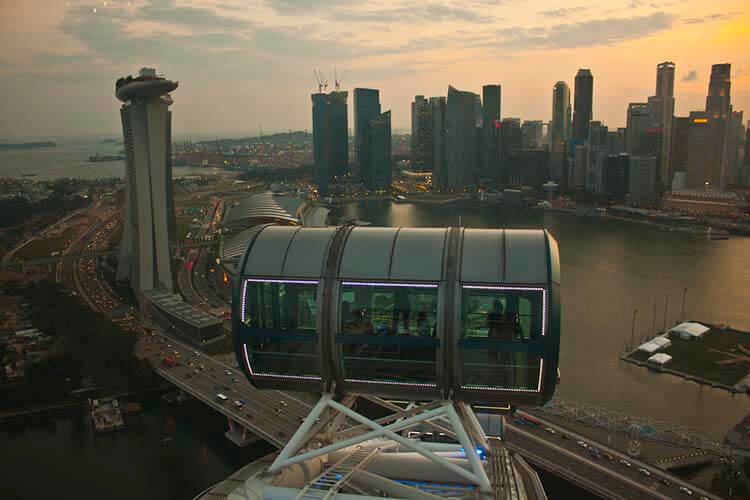 You will be encompassed in 28 city-bus-sized air-conditioned capsules and witness some breath taking views from the top. The views are so radically different in the day or night, that you will not be able to get enough of it. A wonderful opportunity for people to browse through the city highlights such as Marina Bay, Padang, Singapore River, Raffles Place, Empress Place, and much more. The ride lasts for approximately 30 minutes. Post the ride, you can also indulge in plenty of shopping where you can purchase various items like luxury watches to jewelry. You can also indulge in various spa treatments such as Dr. Fish spa and foot reflexology along with grabbing a quick meal at the various yummy food counters and restaurants. Located in the Great World City Mall, the unassuming entrance is not the actual representation of the huge jungle gym. There are slides, mazes, suspension bridges, and every obstacle which you can ever imagine – sufficient enough to keep your little ones engaged and busy. There is a playground in the center where you have a 10-meter tall climbing labyrinth that is filled with trampolines and nets where your kids can practice being Spider-Man. The main play area is ideal for kids aged between 3-12 years. There is a separate area set for toddlers which are stuffed with several toys and a ball pit. A bistro in the neighborhood allows the parents to grab a quick coffee and some small bites in the meanwhile. 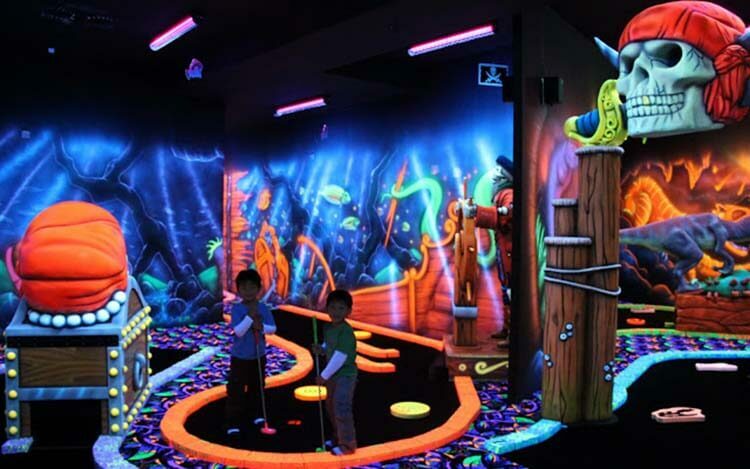 There are also two play rooms where you can indulge in some hands-on-fun activities with your kids. 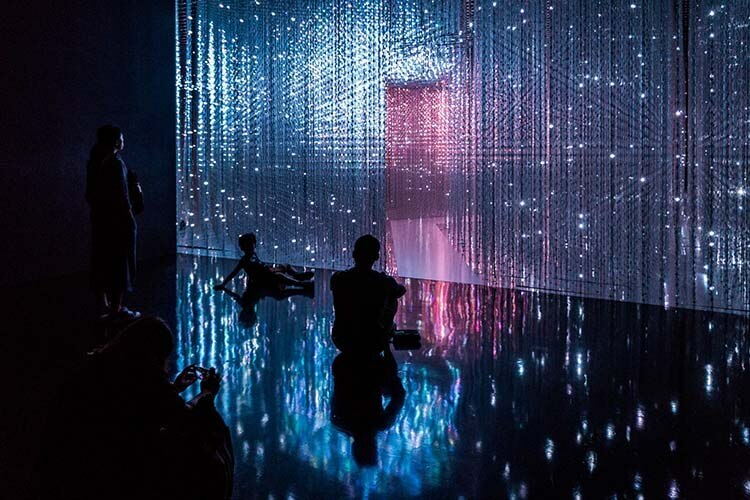 This ArtScience Museum is the first-ever of its kind permanent exhibition of the world’s high-tech immersive digital art installations. It is just hard to miss out of artistically innovations in the world, and this place will surely catch the curious eyes of all age groups. It features 15 works by the award-winning Japanese art collective team Lab with new works being constantly updated. Some of the popular pieces include the Crystal Universe, which features 170,000 LED lights which change colors and the Universe of Water Particles, which is an 8-meter tall digital waterfall that pours down water particles in accordance with laws of physics.